Who doesn’t love to eat out? There is always something exciting about it. The smells, the sounds, the flavours, and people all blend together to trigger our five senses. This isn’t just a meal. It’s an experience. Food halls have been around for a while now but over the past couple of years the concept has seen extraordinary growth rates, especially in Europe. They come in a variety of shapes, sizes and locations, but the core of the experience is the communal enjoyment of diverse, freshly-prepared, authentic food. 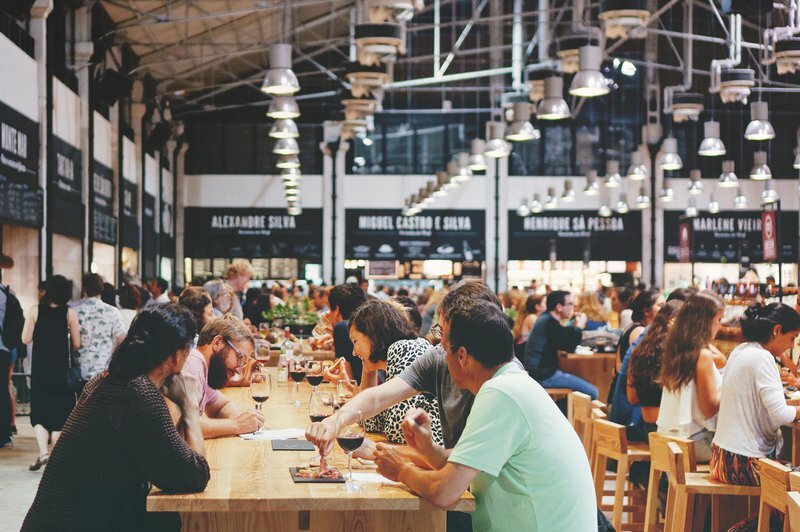 One of the most popular food halls in Europe can be found in Lisbon. 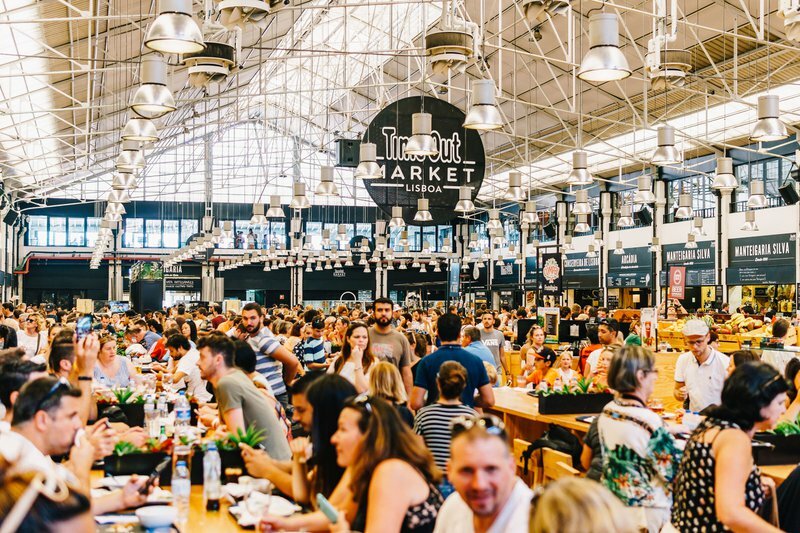 Nestled close to the water’s edge of the Tagus estuary you’ll find Time Out Market, a bustling collection of more than 40 high-quality food vendors, brought together under one roof. Although the venue’s success did not occur instantly, its rise in popularity has been meteoric and it now attracts more than 3 million visitors per year. This success story is by no means unique. From Oslo to Madrid, this concept is almost always greeted with a steady flow of visitors, lead by a travel-savvy young generation. Traditional food markets have been around the European mainland for decades, if not centuries. These venues were known for providing high-quality food at unbeatable prices, and were often located in dilapidated buildings in less than stellar neighbourhoods. This made them largely invisible to a wider audience, although they often had a loyal local customer base. The change began around 2000, when markets like La Boqueria in Barcelona started reinventing themselves looking to attract business from a new generation of office workers, residents and tourists. People started showing a bigger interest in various aspects of food – its origin, and how it is produced and prepared. This resulted in communities reconnecting with their own sense of place. Over time, regional cuisine changed to cater for the introduction of new foodstuffs, while still upholding strong local culinary identities. Younger people, more mobile than any previous generation, were used to eating out while traveling, and started frequenting eateries and restaurants while back in their own countries. Although higher disposable incomes meant they could dine out more regularly, they were also very demanding in the quality and type of food they preferred. Flavors discovered in other countries started appearing on local menus as part of an approach to eating out led by experiences. The younger generation is also prone to using social media to share experiences. Food Hall operators that were quick to identify the promotional value of these digital channels had a huge advantage, and the photogenic nature of their high quality food and drink enabled many to build up huge followings on popular social media platforms, often at very little cost. The emergence of these food halls was not uniform across Europe and began in Mediterranean countries, where culture and climate promote eating out. One of the fascinating aspects about the venues that have recently opened in Europe is how different they are. Some are part of a wider regeneration initiative for former industrial areas, while others are centrally located. Some are partially outdoors, highlighting the connection to street markets, while others are completely enclosed. Some have taken over spaces, while others are purpose-built. Some operators have configured their spaces to allow for performances such as live music performances and other cultural celebrations, while others focus exclusively on food and drink. Some venues embrace street food, while others prefer a more upmarket approach. There are however also many similarities, the first of which is intensive use of social media to draw first-time and repeat customers. 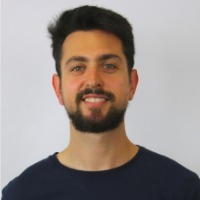 Many use a business model that is based on the venue operator generating primary income through bar sales, with a modest cut of the food vendors’ revenue providing a secondary income stream. It is widely recognized that food prices should offer excellent value for money, resulting in less pricing variation than is found in traditional restaurants. Food vendors are most often small, independent traders and operators universally agree that the food and drink quality should be first class. The first two new generation food halls in the Netherlands opened in 2014 and use widely divergent approaches for the same concept. Three friends (Chong Chu, Tsibo Lin and Zing-Kyn Cheung) with a background in hospitality, joined forces to create De Foodhallen in Amsterdam. Food is served by 20 vendors within a renovated tram depot, De Hallen. The Markthal in Rotterdam was designed and built from scratch by developer Provast. This mixed-use city center regeneration project consists of a ground floor food market with 96 stalls, surrounded by 20 restaurants and shops. This destination attracts up to seven million visitors per year due to the striking architectural structure combined with prepared food and produce. Smaller venues in Rotterdam have also become extremely popular, especially at lunchtime when there is an influx of both tourists and local office workers. The creators of Foodhallen have in the meantime not been idle. Cheung, one of the original founders explained recently that although they have had plenty offers to open new Foodhallen if different cities, they have been waiting for the perfect location to reveal itself. This finally happened in August last year with the Foodhallen Rotterdam opening its doors in the warehouse Meesteren. The team is expecting an initial visitor count of some 325 thousand visitors per year. The Foodhallen team is not done yet, and are planning to open their next venue in The Hague later this year. The World of Food in the Southeastern area of Amsterdam, offers food from across the globe under one roof. It is situated in the old Develstein parking garage and some 32 vendors offer a wide variety of food including Bacchus Student Café, Taste of Africa, Duncan’s Place, Istanbul Grill restaurant, McDonald’s and Flavourtown. Another popular food hall in The Hague is Minglemush, located right next door to the Central Station. Fifteen food stands together form a culinary trip around the world, with a menu of high-quality dishes around a concept that brings its own personality to the hall. You will also find terraces and arcade games under the same roof. With the children busy, the parents can relax and enjoy the good food and relaxing atmosphere.